Charah LLC has opened a fly ash storage terminal in Kelim, Colo., north of Denver, in partnership with Great Western Railway of Colorado operator and rail-to-truck transloading services provider OmniTRAX. Geared to Rocky Mountain States concrete producers, the facility joins the Charah MultiSource Class C and Class F fly ash distribution network, whose recent expansion has also seen new terminals in California, the Midwest, New England and the South. “As one of the leading fly ash sales and marketing companies in the country, our new terminal location and partnership with OmniTRAX ensures that we are able to provide a steady and reliable supply of ash for concrete producers throughout the Metro Denver marketing region,” says Charah Vice President of Ash Sales and Marketing Scott Ziegler. Schwing America has closed on the assets of truck-mounted, telescopic conveyor manufacturer Loop Belt Industries. The acquisition includes intellectual property, patents, copyrights and trademarks surrounding a product line anchored by 33- and 40-meter truck mounted telescopic conveyors, plus a 40-meter tractor trailer mounted model. “This adds diversification to our portfolio and will provide our customers with enhanced, high performance concrete and aggregate conveying options,” says Schwing America CEO Bill Murray. Loop Belt Industries President Joseph Gallione has joined Schwing America as senior product engineer and Operations Support manager. He will continue to lead the product line and oversee transition of equipment production from Glen Ellyn, Ill., to the Schwing America plant in White Bear Lake, Minn.
A new global marketing agreement focused on manufactured-concrete producers calls for the Besser Co. sales organization to promote the automated production and robotics-enabled handling solutions of St-Hubert, Quebec-based Slab Innovation, Inc.
“We’re looking forward to showing industry members how cost-effectively they can introduce robotics into their facilities for packaging, product inspection, vacuum grippers, pallet handling, antiquing systems, splitting lines and wet cast demolding,” says Besser Director of International Sales and Applications Engineering Duane Rondeau. “We’re excited to expand our global industry presence to producers throughout masonry, hardscape, manufactured stone, pipe and precast,” adds Slab Innovation President Benoit Slavinski. “This will allow us to focus our resources on development of engineered robotic solutions addressing the unique needs of the concrete products industry.” From the Besser booth, he adds, the company will demonstrate its robotics technology at the ICON Expo 2018 Machinery & Equipment Show, February 9-10 in Indianapolis. 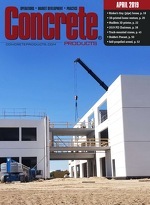 Concrete Products visited RexCon’s newly built headquarters, south of Milwaukee, in 2009. Chattanooga, Tenn.-based Astec Industries Inc., has acquired the assets of concrete batch plant manufacturer RexCon LLC, Burlington, Wis., in a $26 million cash transaction. A key player in central mixed equipment, RexCon becomes a sister operation of Albuquerque, N.M.-based CEI Enterprises, which has built a transit mixed equipment line under the Fusion banner. Former principals Jake Jacobs and Mike Redmond, he adds, will continue to run and develop RexCon, which joins the Astec Industries Energy Group, alongside CEI Enterprises and water heater equipment specialist Heatec.